მარდუკი — ბლეკ მეტალ ჯგუფი ნორჩეპინგიდან, შვედეთი. ჯგუფი ჩამოყალიბდა 1990 წელს, ხოლო მათი პირველი ალბომი 1991 წელს გამოვიდა. მათი სახელი მომდინარეობს ბაბილონეთელი ღმერთის, მარდუკისგან, რომელიც ითვლებოდა ბაბილონის მფარველ ღვთაებად. მარდუკის დამაარსებელი იყო მორგან სტეინმეიერ ჰოკანსონი (Morgan Steinmeyer Håkansson), რომლის მიზანიც იყო „მსოფლიოში ყველაზე მკრეხელური ჯგუფის“ შექმნა. თავდაპირველად, ჯგუფის მუსიკალური სტილი იყო დეზ მეტალი ბლეკ მეტალის ელემენტებით. მათი სტილი პროგრესირებდა წლების განმავლობაში და გარდაიქმნა ბლეკ მეტალის სწრაფ და ინტენსიურ ფორმად. ჯგუფის ტექსტებში დომინანტი თემებია სატანიზმი, ქრისტიანოფობია, ნაწყვეტები ბიბლიიდან, სიკვდილი, მესამე რაიხის ისტორია და მეორე მსოფლიო ომი. ბოლო ორი მოგვიანებით დაემატა ჯგუფის ლირიკულ/კონცეპტუალურ თემებს, მათი 1999 წლის ალბომის, Panzer Division Marduk, გამოშვების შემდეგ. ჯგუფმა ჩაწერა რამდენიმე სიმღერა, რომელიც კაცობრიობის ისტორიის ამ ნაწილს ეხება, მაგალითად: The Hangman of Prague (რაინჰარდ ჰაიდრიხის ფსევდონიმი), Night of the Long Knives, Deathmarch და სხვები. ↑ Maki, Jeff. Marduk – The fifteen year plague. 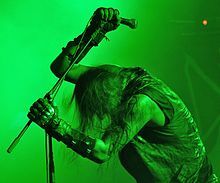 live-metal.net. ციტატა: „Guitarist Morgan Håkansson formed Marduk in 1990 with the vision to create the most satanic and blasphemous band, not only from the hallowed metal grounds of Sweden, but anywhere on the globe. In fact, he has said that death and violence are most inspirational to Marduk, with a particular focus on the violence in the Bible for lyrics“ წაკითხვის თარიღი: 2008-10-20. ↑ MARDUK: New Album Title Revealed. blabbermouth.net (2009-06-25). წაკითხვის თარიღი: 2009-06-26.
ეს გვერდი ბოლოს დარედაქტირდა: 13:02, 14 სექტემბერი 2018.